It's almost December 1, which means there are only a few more weeks of shopping left for the holiday season. But what would be worse than not having a new shiny toy for Biscuit on Christmas morning? Make sure you treat the pets on your “nice” list to a little holiday cheer this year. To help you in your shopping endeavors, here are just a few presents that PetRelocation loves to see under any Christmas tree. PetMate Sky Kennel—The Cadillac of pet travel crates, the Sky Kennel is approved for pet travel world-wide. Your dog or cat will be safe and comfortable in this crate for many years to come. Customized Dog Breed Leash Holder—Decorate your new home with a customized leash holder, depicting a silhouette of your dog's breed. With an extensive list of dog breeds, from Goldendoodles to Keeshonds, you shouldn't have any trouble selecting the perfect image. Hang this in the foyer or the mud room and you'll always be ready with a leash nearby when Sneakers decides it's time to go for a walk. DogGiftShop.com recommends ordering by December 18, 2006 for Christmas delivery. A diamond is forever, but a Swarovski crystal collar will grace your dog for years to come. These Swarovski Crystal Bone Dog Collars from Muttropolis.com, a high-end dog and cat boutique, are more than just a collar—they're a necklace! Make sure that Paris, your teacup Chihuahua, lives up to her name. 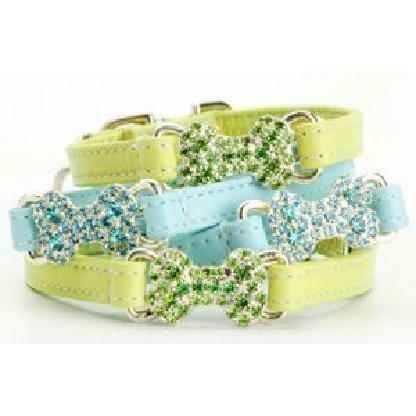 She'll look dashing in an ice-blue leather collar dotted with aqua crystals. And if your other dog, Ryan Seacrest, is feeling a little left out, there are some more manly collars available on Muttropolis.com, such as the Crystal Chic Four Row Diamond Collars. At a steep $200+ they might break the bank, but who ever said being a celebrity dog was easy? If high fashion is your style, the PetQuarter.com brings New Orleans charm and uptown luxury to your pet shopping needs. While you're there, check out their Lagniappe Section, where they have links to charities supporting the pets affected by Katrina. They offer CeCe Kent Designer Fashions, who has designed an array of matching goods for the most selective of pets. If you can't get enough of Kate Spade, they offer the Kate Collection, filled with black and white prints and carriers that mirror the Kate Spade style of luggage. If you and your pooch are more the classic type, check out the Ralph Collection, which boasts rich leathers and traditional colors. My personal favorite is this Ralph Taos Carrier, a carrier for pets weighing up to 8 pounds, made of Italian leather decorated with simple buckles and brass rivets. Perfect for toting DeDe around in Breckinridge over the holidays. For a gift that will last a lifetime, you might want to consider a portrait or photograph of your pets. Paige Morrison Photography is currently dominating the market with gorgeous shots of all sorts of pets, with and without their owners. Her photos capture the energy and love that people have for pets. Just remember during your shopping—it's the thought that counts! And sometimes, when it come to pets, the most exciting part for them is tearing up the wrapping paper and batting the ribbons around after all of the presents have been opened.